Your travels begin along Scotland's West Highland line, taking you to Spean Bridge, Bridge of Orchy and Edinburgh, where the first part of your journey concludes and the second part begins as you travel up the eastern coast to Keith and across the country to the picturesque west coast village of Plockton, on to Inverness and then south to Perth. Journey is also available Northbound traveling round-trip from Edinburgh based on your travel preference. The train departs from Edinburgh in the early afternoon and heads west through Falkirk, to reach Craigendoran, the starting point for the West Highland Line. While guests enjoy an indulgent afternoon tea, enjoy the spectacular scenery passing before you. Spot the distinctive peak of Ben Arthur (also called The Cobbler), a favorite with climbers. Soon you also catch a first glimpse of Loch Lomond. After climbing up the waterfall-rich Glen Falloch, the train continues north to the village of Spean Bridge for the night. Enjoy an informal dinner followed by entertainment in the Observation Car. Overnight train. As the train travels west, passing through Fort William, don't miss the views of Ben Nevis, at 1344m the UK's highest peak. Traveling by the side of Loch Eil you then pass Glenfinnan, with its impressive curved viaduct, and Lochailort, before turning north along this dramatic coastline to Arisaig. Disembark here for a leisurely walk along the beautiful Morar Sands, with breathtaking views across the Sound of Sleat to the Isle of Skye with its distinctive Cuillin Mountains. Back on board, lunch is served as the train retraces its route towards Fort William. Disembark here and enjoy a visit to historic Glenfinnan in the company of our Highlander who brings to life the stories of Scottish heroes before afternoon tea. Alternatively, a guided hike is available (weather permitting). A mountain ranger guides you through the scenic Nevis Gorge to The Steall Waterfall, the second highest in the UK. Today's destination is the charming Isle of Bute, reached by ferry. The island is rich in geology, history and wildlife, with a varied landscape to explore. 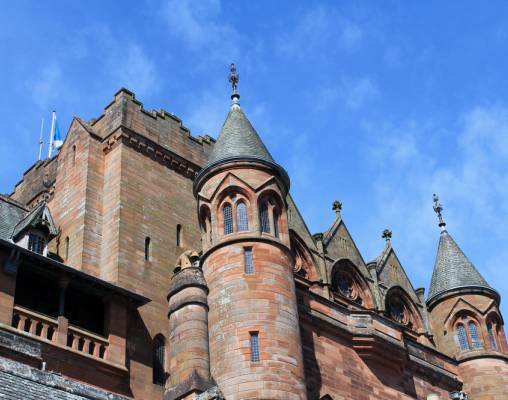 Guests enjoy a fascinating visit to Mount Stuart, a Victorian Gothic house with arguably the finest privately held collection of family portraits in Scotland. Return to the train for a formal dinner. Overnight train. After an early departure from Gourock this morning, enjoy a leisurely breakfast as you travel east towards Edinburgh where this first part of your Grand North Western draws to an end in Waverley Station. 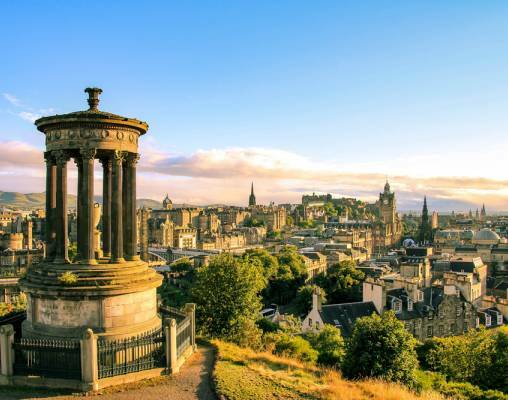 Spend the morning in Edinburgh by joining a guided tour and enjoying a light lunch before returning to the train for the next part of your journey. The train pulls out of the station in the early afternoon and travels north, crossing the Firth of Forth via the magnificent 1.5-mile long Forth Railway Bridge, which was built by Benjamin Baker in the 1880s and is considered by many to be the eighth wonder of the world. 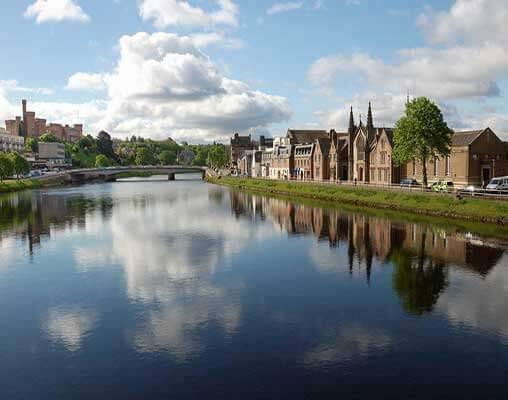 The train proceeds through Fife towards the city of Perth, during which you are served a leisurely afternoon tea, passing Arbroath, Montrose and Aberdeen before arriving in the market town of Keith. This evening enjoy an informal dinner followed by entertainment in the Observation Car. Overnight train. Disembark the train in Plockton, take a boat trip to see wild seals or enjoy a dram and a traditional highland welcome in the Plockton Hotel. Alternatively, visit Eilean Donan Castle, one of Scotland's most iconic sights, and learn how the castle was painstakingly restored to its former glory. Spend the night on board in Kyle of Lochalsh. 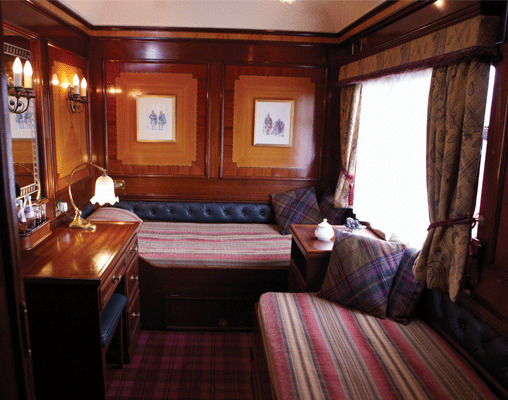 Enjoy a formal dinner and perhaps a nightcap with your fellow guests in the Observation Car which offers mesmerising views over Loch Alsh to the Isle of Skye. Overnight train. After breakfast the train heads back towards Dingwall, skirting the Beauly Firth and crossing the top of the Caledonian Canal, north of Loch Ness, before reaching Inverness. The train continues south to Carrbridge, where guests disembark to visit the romantic Ballindalloch Castle with its wonderful gardens. Options at Balindallocah include a private castle tour, 9 holes of golf on the castle's own course or an exclusive look at what is Scotland's only single estate distillery. The night is spent on board at Boat of Garten on the private Strathspey Railway. After dinner, our Highlander regales guests with stories of local heroes and their derring-dos, even demonstrating some authentic weaponry. Overnight train. Travel by coach to Rothiemurchus Estate in the heart of the Cairngorms National Park, where activities such as fishing, clay pigeon shooting, or a guided walk through the stunning landscape can be enjoyed. Rejoin the train at Kingussie, where lunch will be served as you journey south through Blair Atholl and Pitlochry to Dunkeld. Here you disembark for your visit to Glamis Castle, childhood home of the late HM Queen Elizabeth, The Queen Mother. Return to the train for a formal dinner and entertainment. Overnight train. Breakfast is served as the train leaves Dundee and crosses the Tay Bridge into the former Kingdom of Fife and on to Edinburgh, where your luxury rail journey comes to a close. 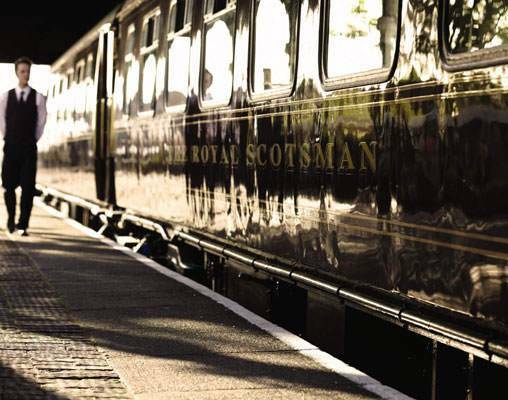 Enter your details below if you would like to be notified when 2021 dates and prices are available for The Royal Scotsman - Grand Western Scenic Wonders. *Prices are per person and include all table d'hôte meals, all alcoholic and other beverages, sightseeing per itinerary, and accommodation on board based on two people sharing a twin compartment or one person in a single. Air fare is not included in the price of this vacation package. Itineraries are subject to change and full details will be confirmed with your tickets. Pricing above is based on the currency conversion effective 3/18/19, and can vary based on the exchange rate at the time of booking.